This time, it's a look at life in a town where a paladin holds true. The paladin is a natural civic leader. Charisma through the roof, divine favour and their code of conduct inspires trust and respect from citizens. Soldiers of faith rarely retire and those who settle down are planning for long-term campaigns. Whether a light in the dark or jewel in a crown, the paladin's city keeps vigilant. Evil never sleeps after all. Paladin towns are militarised by default. They are usually targeted by evil so will build defences in response to potential attack. Even passive religions know the virtue of defensive construction. 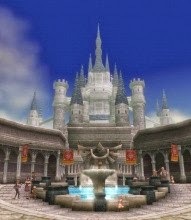 As with clerical towns, the temple is the hub. Given the paladin's force of personality, civic functions and spiritual needs are consolidated with less risk. Clerics of the same faith may provide ancilliary aid and run temples. Paladins will minister if clerics are in short supply. Most paladins however are more champions than shepherds. The citizens of a paladin's city may fall into two broad camps. Those helping the paladin rule may range from fellow knights to the city watch to civic officials. The laws of this city are just and this often requires additional administration. Those who are ruled tend to need regular help. This drives the paladin and his court to build for the long-term to save them. Orphanages with workhouses, courts for settling disputes, prisons to confine criminals and hospitals for the sick all feature. Everything has a place in this city. taxation of vices and iniquitous paraphernalia. prohibition of poisons and chaotic or evil items. seizure and re-purpose of assets used for anarchy and evil. Recompense may be offered for the former if well-intentioned, never for the latter. driving off or exiling habitual criminals should punishment fail to correct their behaviour. Paladin spell access is somewhat limited compared to other spell casters. This is compensated by their gamut of special abilities. Detect evil means NPCs have difficulty infiltrating if they have an aura of evil without magic. Laying of hands and other mercies give more skilled paladins options as a healer. Paladins can work amid plague victims with impunity. The smart hospitallers set up quarantine areas. Turn undead means the city has fewer necromantic problems. That said, the spell selection can produce a few surprises. Agriculture - Create water may allow a orphanage garden to flourish. Arbitration - Known for their fairness and justice, the paladin can arbitrate disputes through judicious use of detect spells and sense motive. Healing - Combining cure wounds and lesser restoration with lay on hands makes healing accessible to the just or the needy. At higher levels, various remove spells and delay poison in addition to removing disease may enable a dedicated paladin to save lives. The paladin's city may not appeal to the licentious murderhobo. Those traumatised by urban horrors may find it different. That said, Camelot wasn't exactly a boring place to be. march fo(u)rth to the carnival!